Most artists dream of a career that spans over a decade boasting international accolades, chart-topping hits, and underground classics, Barbadian-born/ Brooklyn-raised Rayvon has garnered this success and more while affectionately being dubbed the “ambassador of hip-hop reggae.” Having shared the stage with monolithic icons The Rolling Stones and Michael Jackson his pop-infused Caribbean flavor has paved the way for the next generation of Barbadian recording artists such as Rihanna, Shontelle, and Jaicko. Rayvon’s eponymous third album. 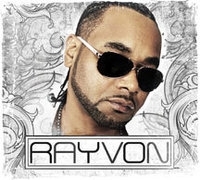 Rayvon features track work from heavyweights such as Jah Snowcone (Sean Paul, Vybz Kartel) as well as the production prowess of Danny Champagne, Ali Cat, and Carl “Beaver” Henderson. The first single “Back it Up” is a hard-edged pulsating groove that have guys jumping and ladies gyrating. From “Hustle and Flow” to the pop reggae lilt of “Wedding Song,” the album result is an explosive collection of sonic heavy hitters (“Riding Skill”), Euro dance (“Private Dancer”), and his patented brand of hip-hop reggae (“Get Money,” “Bang Bang”). To date, “Back It Up” has garnered Rayvon an International Association of Independent Recording Artists (IAIRA) award and ranked in at No. 1 on Indie-Music.com’s top 25 for 2011. The second single “One N Only” is swiftly giving chase at No. 2. Rayvon is probably best known for his work with multi-platinum selling vocalist Shaggy. The two began collaborating on a string of tunes in the 90’s which culminated in the Sting Int’l produced regional hit “Big Up.” Rayvon says, “We both got our break with that record. It put us in the reggae/dancehall spotlight. I had a smooth-edged style of singing and he had that rough DJ style. The chemistry was amazing.” Rayvon was also featured covering The Melodians' classic “Rivers of Babylon” on the B-side of Shaggy’s 1993 hit “Oh Carolina ”. The following year Rayvon’s solo star began to brighten with the release of his hip-hop reggae classic “No Guns, No Murder” (produced by Funkmaster Flex) on the venerable VP Records. The track hit a trifecta on Billboard, ranking in simultaneously on the Hot 100, Rap Singles, and R&B/ Hip-Hop Songs charts. VP issued the follow up “Pretty (Before I go To Bed),” which quickly impacted the Billboard’s Rap Singles chart. Rayvons’ career trajectory accelerated in 1995 when he recorded the island-tinged duet “In The Summertime” from Shaggy’s platinum, Grammy award-winning album Boombastic . The song was a cover of Mungo Jerry’s 1970 hit and following in its original success Shaggy’s version with the help of Rayvon reached No. 3 on Billboard’s Hot 100 and No. 5 in the UK while also featured in various major motion pictures and television series. Rayvon previously released two solo albums including Hear My Cry (Virgin Records 1997) and My Bad (Big Yard Music/MCA Records 2002). Though hopes were high for his impressive debut album, it largely hovered under the radar in a whirlpool of label politics. “I came out in a year where it was like a small dog among big dog. Virgin released albums by UB40, Janet Jackson, Rolling Stones, and the Spice Girls that same year. I was caught in that whole whirlwind.” The release of “2-Way” off the sophomore effort reached No. 10 on BET’s 106 & Park countdown and chimed in on Billboard’s R&B/ Hip-Hop Songs chart. The title track “My Bad” stands at 84 thousand views on YouTube, featured a cameo from cohort Shaggy and boasted No. 1 at Top 40 Radio for four weeks. On March 8th check out Rayvon on the Monique show on BET Network.